What are you doing for Valentine’s Day this year? I’ll be spending it with a charming and talented woman. Please don’t tell my wife. Susanne was one of the founding members of our club in 1971. She has created some great trees over the years, perhaps most notably the grove of elms on permanent display at the National Bonsai Museum in Washington, DC, and a Zelkova grove, shown in the photo, on permanent display at the Huntington in San Marino (which you can see if you attend the Bonsai-a-Thon). 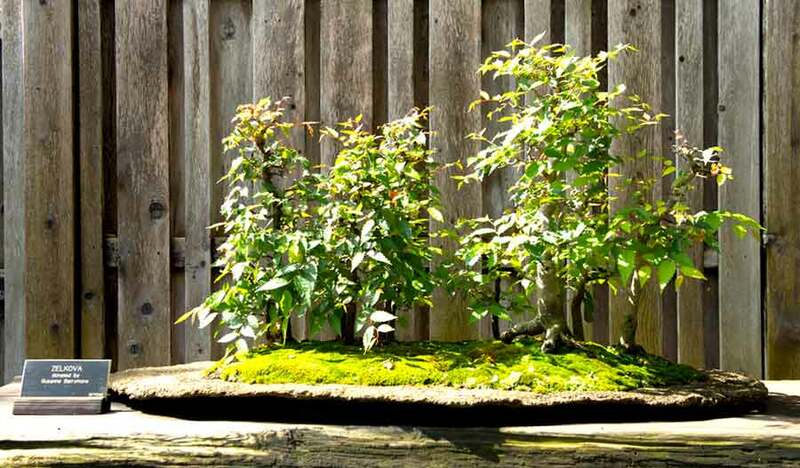 Both of these groves are planted on artificial rock slabs, or "Su-ishi" as Susanne calls them, which she made. Susanne also makes beautiful oriental scrolls (susannebarrymorescrolls.com), one of which usually hangs in the tokonoma at our annual show. 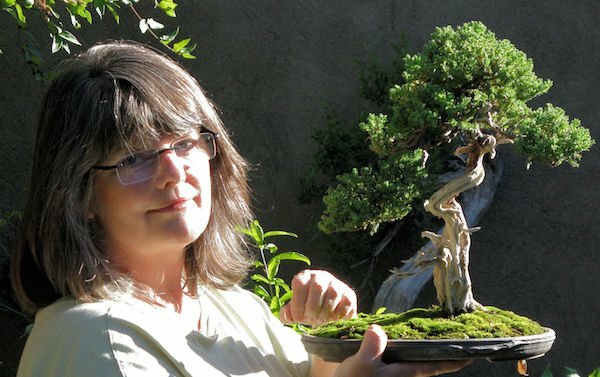 She will be demonstrating how to create a root-over-rock bonsai on Tuesday, February 14 at the Goleta Community Center. 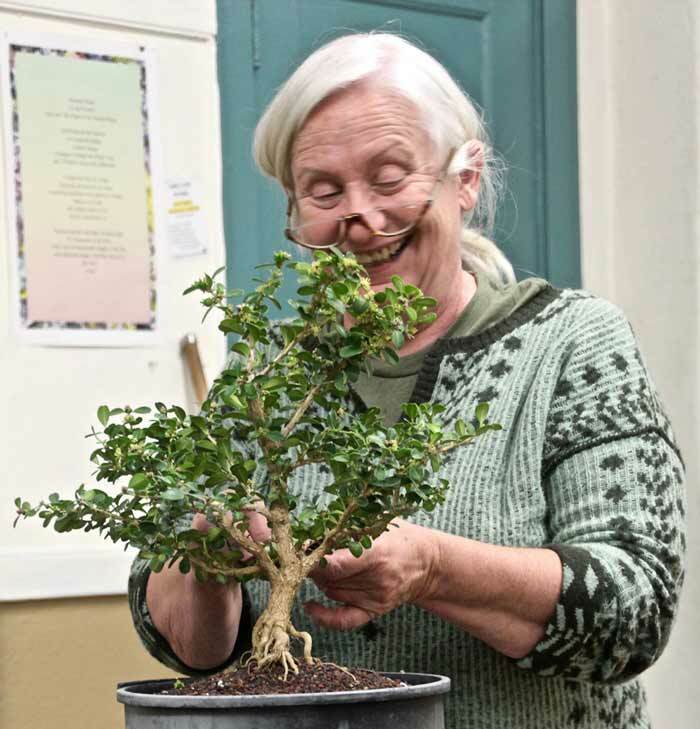 Get to the meeting early and Susanne, our club librarian, will help you check out a book from our extensive bonsai collection. 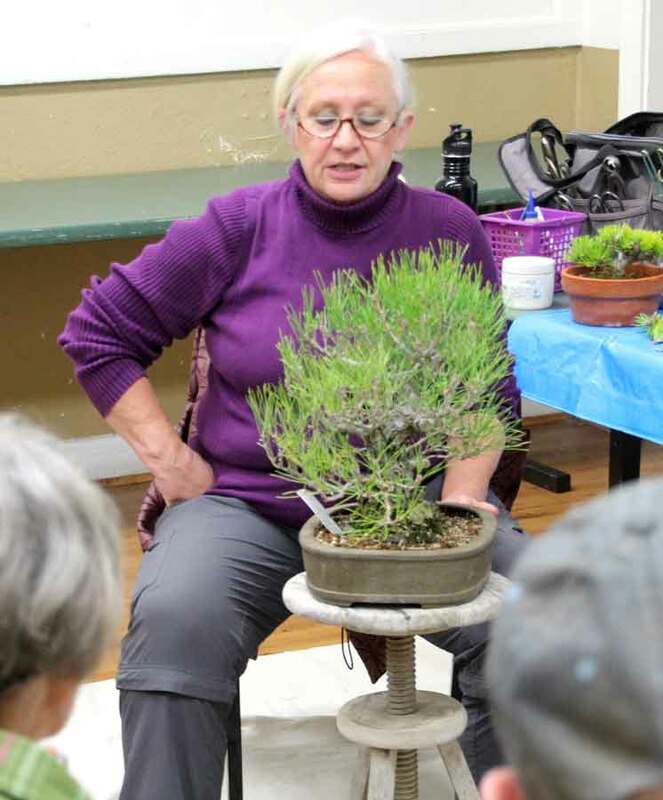 Ann Erb chose a few pine trees from her vast collection and demonstrated how to needle prune, trim and wire branches, and how to wire trees into their pots. We all learned a lot, including that Ann is thinking of adding another 2500-gallon water collection tank to her back yard (she already has 3 tanks!) Soon, Southern California will be buying water from Ann instead of the state. 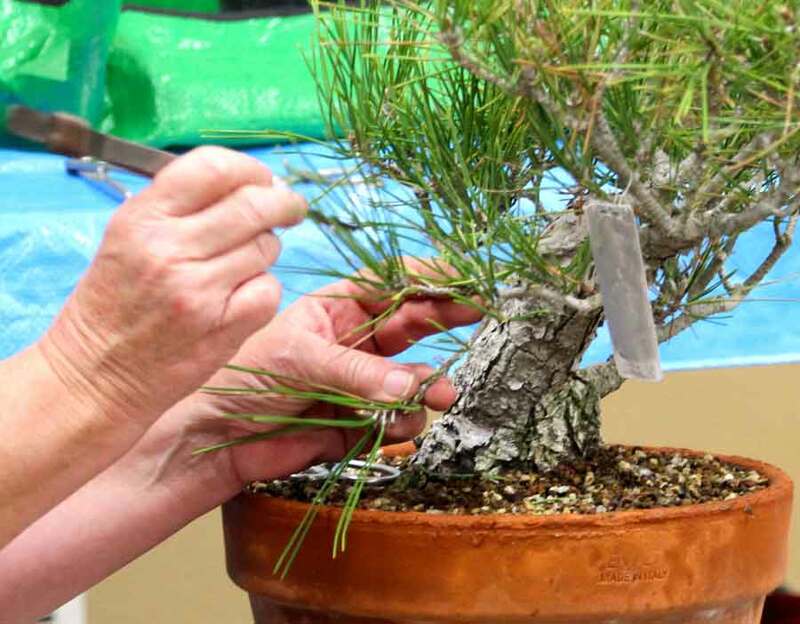 Ann suggests when needle pruning to leave just three to five needles on large branches, 7-9 on weaker branches. 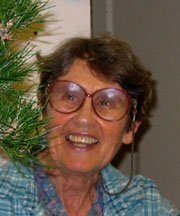 She also suggested getting rid of needle-cast, damaged and older needles first, and to leave buds on branches for future growth. Needle pruning is best done late November to early December. Now is a perfect time to repot your pine trees. She uses a bonsai mix of 50% acadama, 25% scoria, and 25% crushed granite. Ann suggests using copper wire to wire your trees into their pots, as it tightens well without breaking when you twist it. When wiring branches, she suggests making one turn on one branch then wiring the opposite branch, before finishing on the first branch. This causes the least damage to valuable bark. She also cleans up all major cuts with a sharp knife, brushes on rooting compound to aid callusing, and seals with cut paste. We were all exhausted just from watching her do all this. Ann carefully needle prunes weak branches. She finishes by cleaning up cut. Ann contemplates where to start. 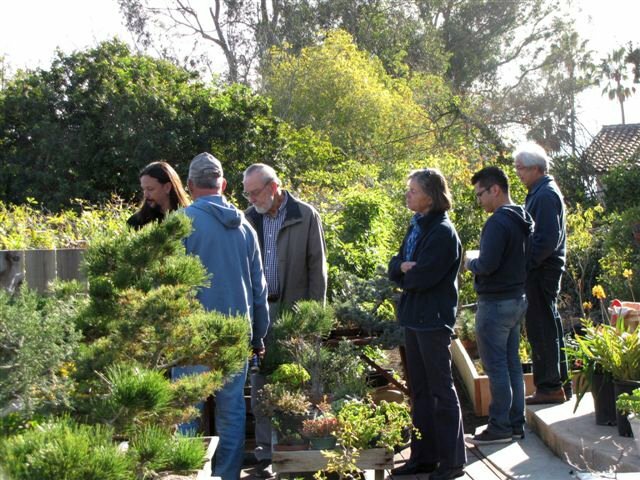 February 18: Bonsai Club Of Santa Barbara: 3rd Saturday Workshop With Guest Instructor. 9 AM until noon or 1 to 4 PM., Room 7, Goleta Valley Community Center. Cheryl Manning, guest instructor. 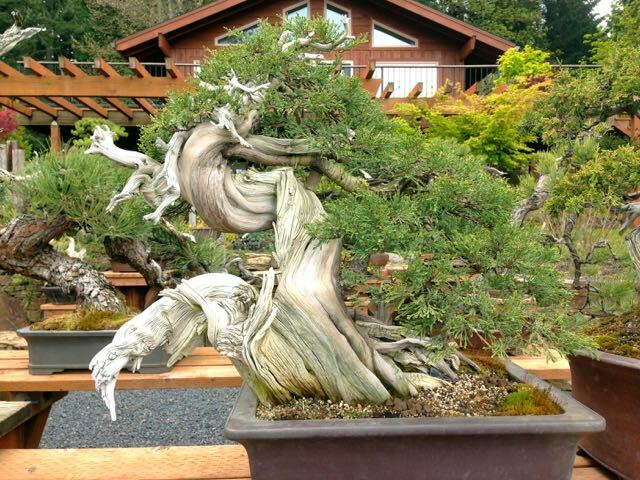 February 18 - 19, 2017 Oakland, California GSBF Bonsai Garden at Lake Merritt: The annual Mammoth Auction and Sale Fund Raiser will be held at 666 Bellevue Ave. (Garden Center Building). Saturday: Auction preview at noon with Auction starting at 1 PM. Sunday: Vendor Sales start at 9 AM, Plant Sales start at 10 AM, and demonstrations at 1 PM. 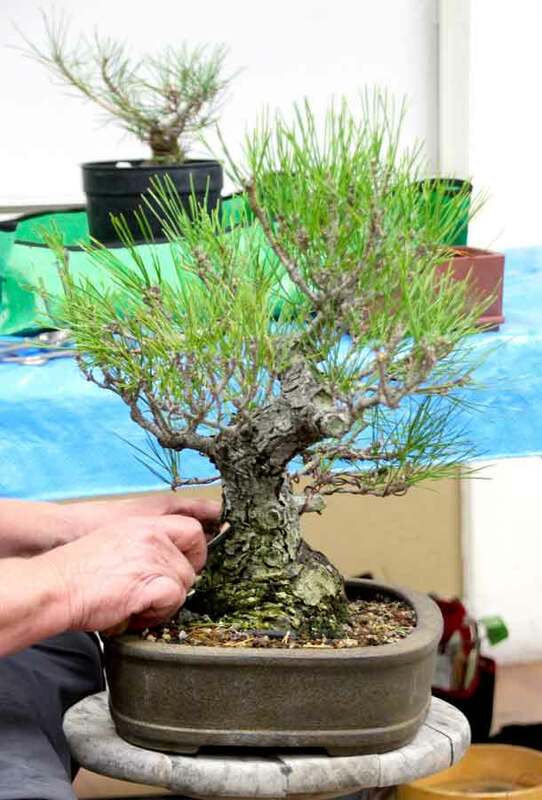 The date for this year’s event is a week earlier than in the past to let attendees and vendors participate in both the Mammoth and the Bonsai-a-Thon. 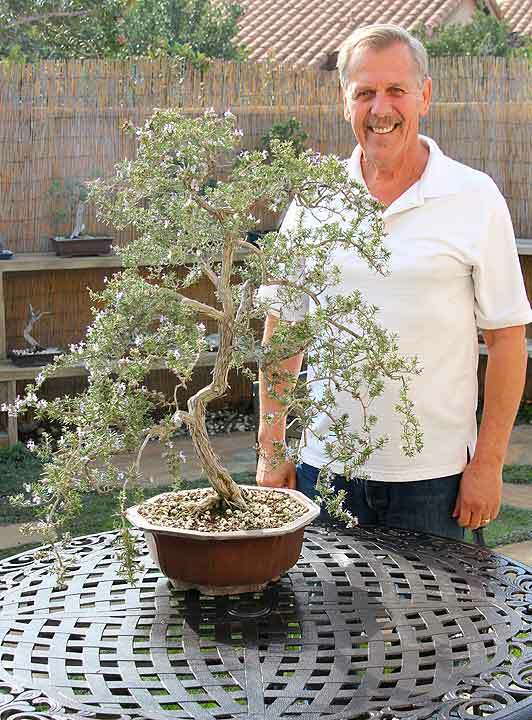 You are encouraged to submit your bonsai for consideration to be included in the Mammoth Auction as soon as possible. Items will be considered on a first-come-first-considered basis. The Bonsai Garden will be open 10 AM to 4 PM on Saturday and Noon to 4 PM on Sunday, so you can check out the many changes that have been made this year. 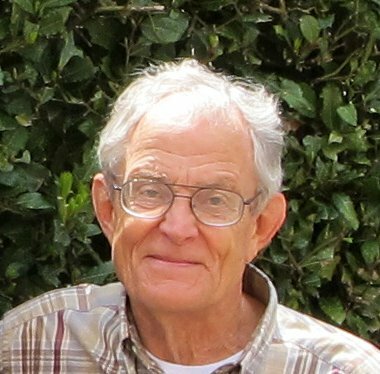 For more information or to sell trees, email bonsailakemerritt@gmail.com and visit www.gsbf-lakemerritt.org. phone number, mailing address, and email address. Once you are confirmed that there is space for you, you will be asked to mail a check or credit card number, expiration date and Zip code to GSBF BGLM, PO Box 16176, Oakland, CA 94610. Once purchased, the tickets are non-refundable. I thought it would be fun to include a club member’s tree in each issue of the newsletter. To have your tree included in a future issue, please take a high-resolution photo of the tree, preferably with you holding it or standing with it. This puts a face with the tree and also gives readers an idea how large the tree is. A brief history of the tree would also be great. Because I just thought of this and have not contacted anyone, I’ll start with one of my trees. 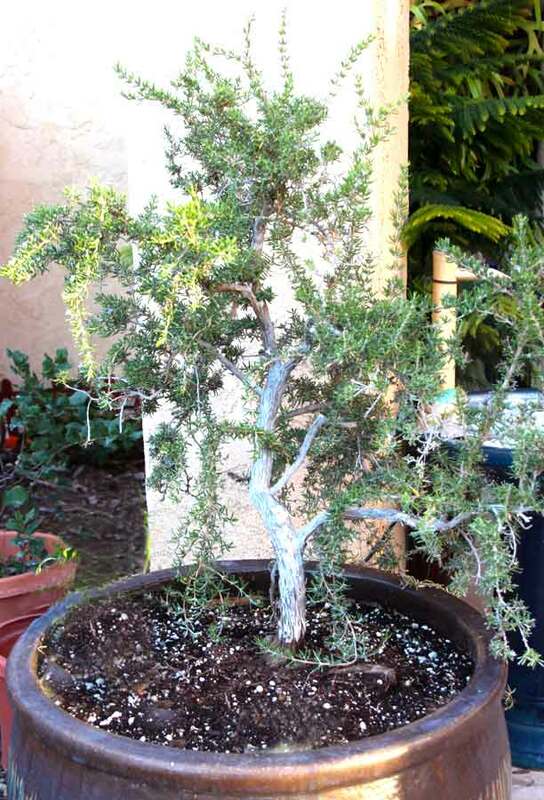 Left photo is shortly after I purchased this rosemary from Muranaka’s Nursery in Nipomo, September 2013, and right is what it looks like currently. Send your photo(s) to ernie@erniesworld.com or to our PO Box.